More Of Him: Does everything seem like a big deal? Does everything seem like a big deal? When you live with pain, sometimes the little things can seem like a really big deal. 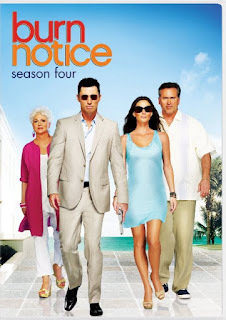 Case in point, I'm watching TV the other day and they announce on USA Network that this will be the last season for "Burn Notice". People, I actually started crying. I know...sad isn't it? It's not that I'm so "hooked" on a TV show, it's just that I had had an incredibly tough day and I heard about this at the end of the day and it just opened the flood gates. Yes, I'm going to miss "Burn Notice" - it's my absolute favorite show, but certainly not worth crying over. When we're overwhelmed by life - pain, financial worries, marriage problems, children problems, etc., etc., the smallest thing can be the thing that sets you over the edge. Sometimes it's easier to be strong for the big things than the little things. You know what? That's okay. One thing I've learned the hard way is to allow myself to feel what I feel. I used to look at being sad as a weakness. I was raised to feel that tears meant you were weak. Admitting you felt sad or scared meant you were a weak woman, so I just stuffed those feelings down and carried on. However, those feelings come out one way or another. We will comfort those feelings by smoking, drinking or over-eating, to name a few. How much better is it to just feel what we feel and get it done? I know something else, though, too. Feeling the feelings doesn't cure it all. It doesn't give me strength where I need it. Only Jesus does that for me. He gives me strength when I have none. The Lord is my rock and my fortress and my deliverer; My God, my strength, in whom I will trust; My shield and the horn of my salvation, my stronghold. There are countless Scriptures where God tells us He gives us strength. It's there for the asking! Sometimes we don't even know what to ask, but our Spirit does. Sometimes, for me, it's just a matter of sitting quietly before His throne in prayer. Through Him, I gain the strength I need for the moment. 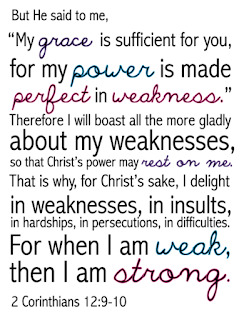 "My grace is sufficient for you, for My strength is made perfect in weakness." 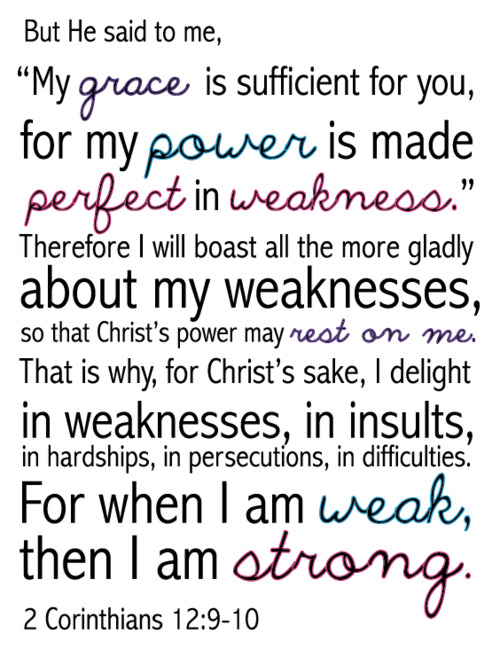 Therefore most gladly I will rather boast in my infirmities, that the power of Christ may rest upon me. Therefore I take pleasure in infirmities, in reproaches, in needs, in persecutions, in distresses, for Christ's sake. For when I am weak, then I am strong. This Scripture tells us the opposite of what I believed. When I am weak, then I am strong! That is what Christ does for us. He makes us strong when we are weak. Through our belief in Christ, we are made strong despite what the world may see. My pain issues look overwhelming to some people but I know the Lord has worked amazing things through this pain. My testimony for Him is stronger than ever. My belief in Him has grown leaps and bounds, because through this pain, I have seen Him work. Like Paul, I can take pleasure in my pain and my needs because I know that I have strength through Christ. I'm so glad that I know it's okay to feel sad but I'm even more grateful that I can lean on Jesus in my sadness because He is there and working all of this together for my good and His glory!! He can do the same for you! Praise God!